Why settle for a metallic clutch when you could carry one made out of real metal? 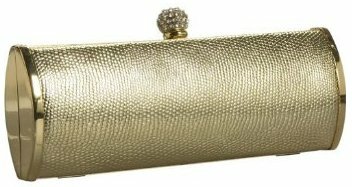 Coloriffics ditches soft satins and silks for something a bit more durable with this Moonbeam clutch. A metal purse could easily have looked masculine, but Coloriffics softens the material with some scaly embossing. Pretty rhinestones covering the clasp work with the silvery finish for an eye-catching evening look. Storage space is limited, but that's often the way with hard cased clutches. I was concerned about my goodies rattling around inside the Moonbeam, but as it's fully lined that shouldn't be a problem. I'm not sure how comfortable it would be to hold a metal purse all night, so I'm thrilled to see Coloriffics includes not one, but two straps. The different chain lengths give us real carrying versatility, and choice we rarely see at this price point. I always feel we're getting a bargain when an evening purse is priced under $50, so I was thrilled to see the Moonbeam clock in at $47. That's a small price to pay for a clutch so unique and durable. The Whiting & Davis Magazine Roll bag, a great alternative to this silver bag.